CHICAGO — The internationally acclaimed Simón Bolívar Youth Orchestra of Venezuela is travelling throughout the United States this week performing in Washington, D.C., Chicago and Houston. The first performance will be tonight April 3 at Jones Hall for the Performing Arts in downtown Houston. For 35 years, the orchestra has transformed the lives of more than 240,000 Venezuelan children – many from impoverished circumstances — through its free-of-charge training and musical education, opening the doors for the youth of Venezuela to become young musicians and to perform with some of the world’s best-known orchestras. The model of education (known as El Sistema) has been so successful that it is now being replicated in other countries, including the United States. El Sistema has grown to be a Venezuelan-wide organization of 102 youth orchestras, 55 children’s orchestras and 270 music centers. The orchestra was developed under the leadership of José Antonio Abreu, a retired economist and musician, who had a vision of creating a national system of youth orchestras in Venezuela dedicated to changing young lives through music. 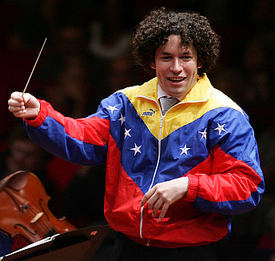 Director Gustavo Dudamel, a 28-year-old phenom in the music world, is the most famous example put forward of what this system of youth orchestras has accomplished. He is passing on his enthusiasm and musical knowledge here in the United States. Dudamel was recently named Los Angeles Philharmonic music director and is starting a Los Angeles-style program for the youth of LA. “Access to quality music education should not be only for those who can afford it. The benefits are too great,” the pop singer said. The tour is being sponsored by CITGO Petroleum Corporation, the national oil company of the Bolivarian Republic of Venezuela. In a company press release it said, “Citgo remains committed to the principles of solidarity under which it gives back to the community and to the most vulnerable in society. Please note that space is limited and priority for reservations will be given to student groups. To reserve seats, call (312) 294-3044 or e-mail institute@cso.org. There is a $1 handling fee per ticket. household, and is recommended for ages 8 and up). Chicago working side-by-side under the direction of Gustavo Dudamel. Thursday, April 9, 1:00 p.m.
replicate its success in America and other countries. Thursday, April 9, 2:30 p.m.
employed in the Venezuelan program.